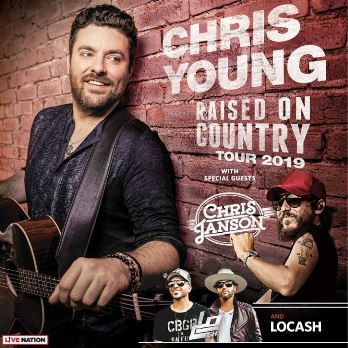 Chris Young: Raised on Country Tour with Chris Jansen and Locash is heading to the Hub City! The tour heads to the Cajundome on Thursday, September 5, 2019. The show kicks off at 7:00 PM. Ticket go on sale to the public at 10 AM Friday, April 19th and pre-sale ticket will be available Thursday, April 18th at 10 AM. Go to www.cajundome.com and join the Cajundome Insiders for more information and pre-sale code access! Tickets available at the Cajundome Box Office & online at Ticketmaster.com.